Check out the pictures from Dr. Scifi's Cosplay Horror Story! You can listen to the episode with his horror story at the end here. Without further ado, here is the full story from our awesome listener! 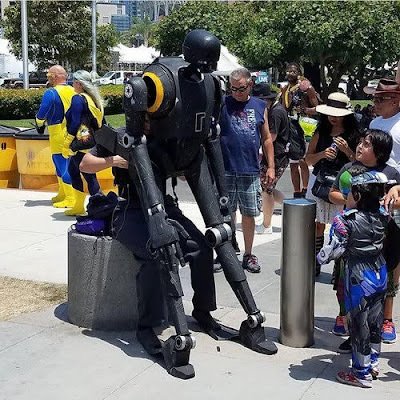 Last year at SDCC (San Diego Comicon 2017) I was attending with my large 7’ 2” K-2SO puppet from Star Wars: Rogue One. I had just arrived and gotten harnessed in and was on my way to the main doors when disaster struck. 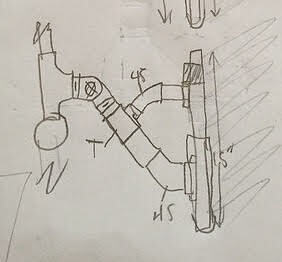 K2 is completely supported by a chest harness I wear and one of the two connection points failed at that moment. His body pivoted on the lower connection and he pitched forward towards the ground. I had no handler friends with me, I’m not even in the convention center yet. I have no emergency kit of tape or zip ties. And I can’t really take K2 off as he is not self –supporting. After thinking it through I wiggled out of the top of my jumpsuit to expose the harness straps. After adding slack in the shoulder straps I crossed them around the harness pipe and lashed K2 to myself. This temporary measure would work until I could get inside and find some tape/zips. The moral of the story is DON’T COSPLAY ALONE when your costume is over 7’. Just don’t do it. Now I always carry some industrial zip ties and a small roll of duct tape on my person at all times when I’m with K-2SO. Here’s a happy cosplayer with his droid, before disaster struck. 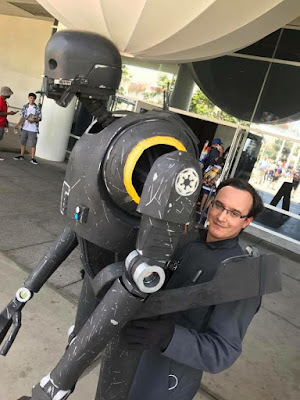 If you would like to see more pictures of K2 you can find them on my website at drscifi.com/k2so Or see images of his sister L3-37. Keep up the great episodes. Ep. 017 - Secrets of Cosplay Docs for Contests! Ep. 015 - Self Care in the Crafting World!